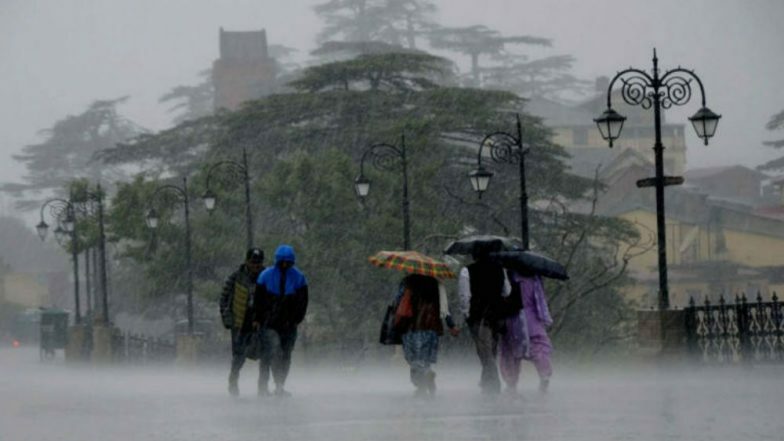 Lucknow, April 16: Bringing some respite from scorching heat, several areas of Uttar Pradesh are likely to witness rainfall and gusty winds accompanied by thunderstorm on Tuesday. According to MeT department Lucknow, moderate thunderstorm and lightning with dust storm accompanied with winds/rain are very likely to occur today during next 3 hours till around 10 AM on Tuesday. The areas that will receive the fresh shower include Baghpat, Meerut, Hapur, Amroha, Muzaffarnagar, Lalitpur, Unnao, Hardoi, Sitapur, Lucknow, Raebareli district and adjoining areas. IMD Sees 'Near-Normal' Monsoon in India; Skymet Says 'Below Average'. According to private weather agency, Skymet Weather, the temperatures are expected to go down by three to four degrees on April 16 and 17 and can come down in the range of 36°C-40°C. The weather agency said such conditions are expected to increase over Uttar Pradesh as a Western Disturbance is over Jammu and Kashmir. Moreover, few moderate to heavy spells are expected over West and Central Uttar Pradesh from April 17, the agency added. MeT Lucknow: Moderate thunderstorm&lightning/dust storm accompanied with winds/rain are very likely to occur today during next 3 hrs (valid up to 10 AM) over Baghpat, Meerut, Hapur, Amroha, Muzaffarnagar, Lalitpur, Unnao, Hardoi, Sitapur, Lucknow, Raebareli dist&adjoining areas. The India Meteorological Department (IMD) on Monday had predicted that the monsoon in the country in 2019 will be "near normal" with the well-distributed rainfall expected to be around 96 per cent. The prediction stands at a moderate error estimate of plus-minus five per cent of the Long Period Average (LPA), IMD Director General K.J. Ramesh said and ruled out any adverse impact of 'El Nino' on the monsoon such as erratic rainfall. In 2018, the IMD had forecast 97 per cent long-term average rainfall, but the actual rainfall stood at 91 per cent at the end of the monsoon season. According to reports, the IMD will come up with the second Long Range Forecast in the first week of June in which quantitative analysis will be done, with predication for the every meteorological sub-divisions in the country.